In anticipation of the upcoming Bboyizm performance on April 25 – 26, 2014 at the Enwave Theatre, we asked a few of the company members to share some details about their early dance days and dance names. Take a look. When did you begin dancing? Which style of dance did you first study? I began dancing at age five. I took a ballet class and really hated it to the point where I told myself I would never take a dance class again. Then, at age seven, my mom caught me imitating Riverdance on TV and convinced me to register for Irish Step Dancing Classes. I liked it and decided to register for more technical dance styles at age ten. What is your favourite street dance? Why? I have two favorite street dances: Bboying and House. Bboying has a special place in my heart because it is the first street dance I was introduced to and I like the challenge it gives me. What I really appreciate about House is the freedom and dynamic that goes along with house music. What is your dance name? Did you name yourself or did another dancer/choreographer name you? I go by the name of Julie Rock. It’s a name that was given to me by my crew when I was about fourteen years old. Even though Rock is a common Bboy/Bgirl name element, they just added it to my first name to keep it simple, just like I am! They said I always rocked the beat, so it just fit me perfectly! I began dancing at age twelve and the first style of dance was Irish Step Dancing. The following year I took on Hip Hop. Bboying; it’s the style I can practice the most freely and the one that matches my energy the most. Bboying was the first street dance I learned, it is what made me fall in love with Hip Hop culture. Miss Marie Monsta. People always called me Miss Marie, so it just stuck. Then, when I moved to Calgary one of my crew mates, Bboy Rein, saw me dance to the song “Monster”. From that moment on he called me Miss Marie Monsta. I started dancing in 1996 and Bboying was the first dance style that I studied. Rockin’; because there are a lot less people practicing this style and I feel there is more room for me to create, explore and express myself freely. Wary the Warrior. When I started travelling to New York and getting familiar with the community, most people had trouble pronouncing my first name, and they would say “Wary…like a warrior”, with time the name stuck and it became my dance name. 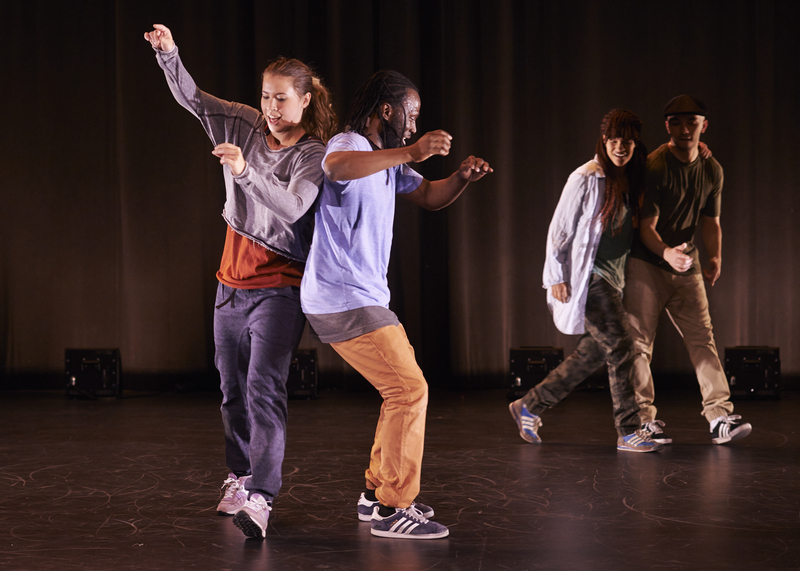 Bboyizm’s new work, Music Creates Opportunity, runs April 25 – 26, 2014 at 8pm at the Enwave Theatre. For tickets call 416.973.4000 or email education@danceworks.ca for a special student and educator promotional code.